Odds are about 50/50 as to whether the public will like or not like Book Club. Four strong, independent women have enjoyed becoming a book club together. When the selections become too boring for Vivian (Jane Fonda), she suggests they read 50 Shades of Gray which they do with a combination of reluctance and interest that moves them back into being interested in the dating world. The fun of it is watching four actresses we have enjoyed in movies for years and seeing them again in their 70s. The not so fun part is that directors Bill Holderman and Erin Simms have pretended that when a woman that age returns to the dating game, she becomes a giddy teenager. 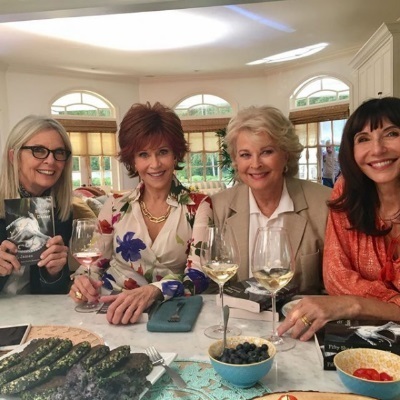 Thinking of a judge (Candice Bergen), a successful founder of a luxury hotel (Jane Fonda), a strong, independent wife (Mary Steenburgen), and the fluttery widow (Diane Keaton) as reinventing themselves as mindless dates is wacky. That probably wouldn’t be true if the writers hadn’t planted the whole story in a culture resembling the 1950s. But they did. Result? These smart, fine actors look silly most of the time as they meet new men or reunite with old ones. Mary Steenburgen and Candice Bergen manage to hold on to their professional dignity and win our support while Jane Fonda seems just silly as the successful rich hotel owner who sleeps around town with whoever catches her eye. As much as we may love Diane Keaton – and who doesn’t? – the role of a widow convincing her children she is not moving west for them to take care of her is a long, drawn out ordeal without much charm. Our good old pal falls into the trap of playing her silly younger self as opposed to the woman she now is. Judge Candice Bergen plays her age well, reluctant to join in her friends’ newly devised dating game. She holds her dignity as she wonders whether to reenter the man/woman culture. It is Mary Steenburgen who carries the movie. As she tries to reignite life with her dour husband (Craig T. Nelson) she remains an adult while her friends suddenly seem like teenagers. And when she breaks into a superb dance routine she shows that the good life at 70 doesn’t have to mean reverting to childhood. She pulls smiles and even a tear from the audience. Andy Garcia, Craig T. Nelson, Richard Dreyfuss, and Don Johnson are fine because they act their age as they fall for these women. Not one of them becomes childish. Result? We like all of them. Why do women have to become silly at seventy? It would have worked if they had approached the guys with their adult selves. Question: how old are the writers of the script? Too young, I suspect, to understand that after writing strong contemporary scenes for these fine women, they then dropped them into the rather inane culture they had inhabited fifty years earlier. This review was posted on May 21, 2018, in Comedy. Bookmark the permalink.